I have never written to the Olympian Editor before but felt a compelling need to let everyone know that Stephen Buxbaum is the right person you need to have as the Olympia City Mayor due to his experience and qualifications. When I was the Director of Human Resources for the Department of Community, Trade and Economic Development, I got to work directly with Stephen for over five years. We had an extremely complex human resource case that required Stephen's leadership. Our case could have easily taken a different course but because of Stephen's due diligence and trust he placed with me as the subject matter specialists, we prevailed in every case. I personally experienced Stephen outstanding qualities. He listened to understand. He wasn't quick to judge or comment until he thoroughly understood the situation. He asked great questions and provided great ideas. Throughout the process, I saw how compassionate Stephen was about people and was instinctively fair. He could have taken the hard line at any time, but instead, he chose to be respectful and transparent. Stephen has proven experience in many areas with people/employees, budget and community outreach. He has a lot of energy with a can-do attitude. He is also a person with integrity, a thoughtful problem solver, and a doer. As Mayor of Olympia, Stephen's leadership skills and personal attributes will make a positive difference in this city. I believe that Stephen Buxbaum is an excellent choice for Mayor of Olympia. As a former colleague and subordinate of Stephen's for approximately 7 years, at CTED, I watched as Stephen thoughtfully and strategically developed a vision. As part of his team, I then witnessed and participated in systematically developing the goals, establishing key relationships and successfully implementing a comprehensive and effective set of programs that impacted and supported many citizens in the state of Washington. My experience with Stephen is that he is a highly intelligent, respectful, supportive person deeply committed to public service. 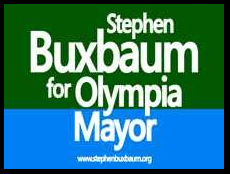 Given my experience, I believe Stephen Buxbaum would be an exceptional Mayor for the City of Olympia. I'm writing because I live just outside city limits and love Olympia and the South Sound region. I can see that Stephen Buxbaum's leadership is needed now. The quality of our future depends on it. Stephen Buxbaum is an excellent public servant. Buxbaum and I worked for the same state agency. He is extremely competent in financial management. He is creative and works to meet multiple interests and needs with a very limited budget. Stephen understands budget issues and he can make tough decisions after hearing from and listening to citizens. Buxbaum is a collaborator. He actively seeks to learn about and understand the needs of various interest groups and he works to achieve consensus. Buxbaum remains open to alternatives even when the discussion among competing groups becomes heated. I watched him build an outstanding and successful organization. He dealt with all issues, including those he inherited from others, and resolved them promptly. Plus, he installed good business practices to ensure past problems would not recur. Buxbaum did this while focusing on the cautious use of the taxpayers' dollars. Stephen Buxbaum is what Olympia needs. He will support citizens and ensure the public is heard.